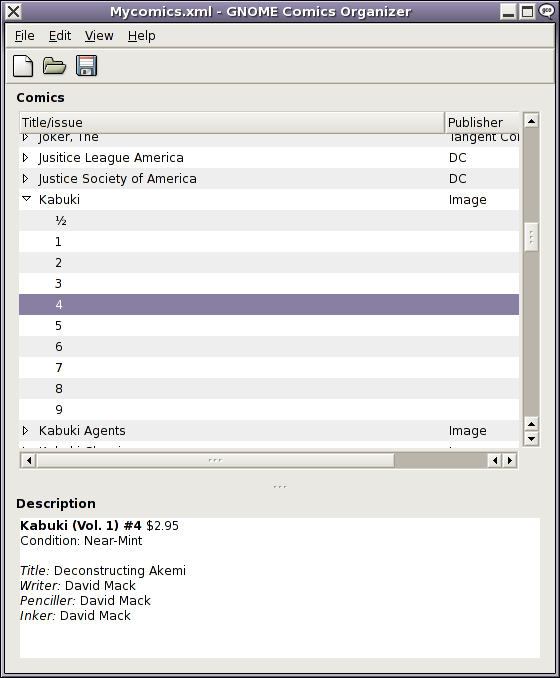 A GNOME interface for reading the Diamond Comics Previews catalog. Written using Python, PyGTK, and gnome-python. Newest version is Previews Reader 0.5.2. Updated downloader to handle new date format in new releases list. 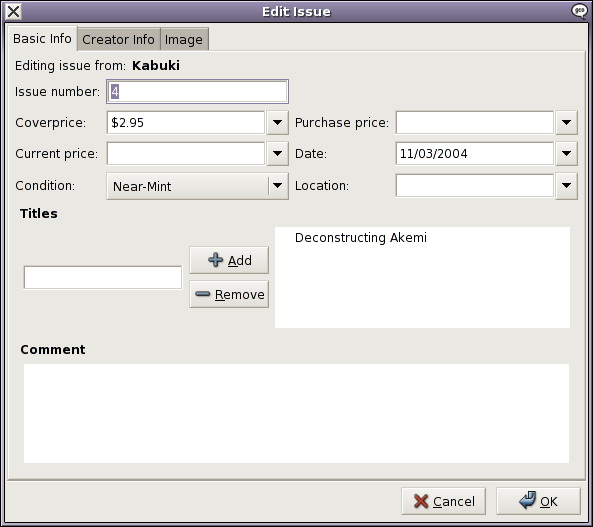 GNOME Comics Organizer (GCO for short) is a program to help keep track of your comic book collection. It has been written in Python using GTK+ and GNOME. Requires python 2.3.x, gnome-python2 2.0.x, pygtk2 2.3.96 (or greater), libxml2-python 2.6.x. 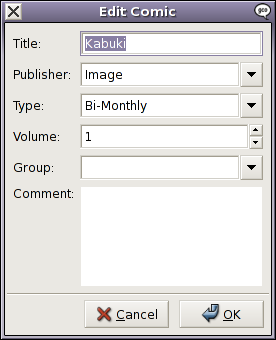 Newest version is GNOME Comics Organizer 0.5.2. Added support for recent file (thanks to Terence Ripperda). Added Ctrl-R as a shortcut for 'Edit Properties'. 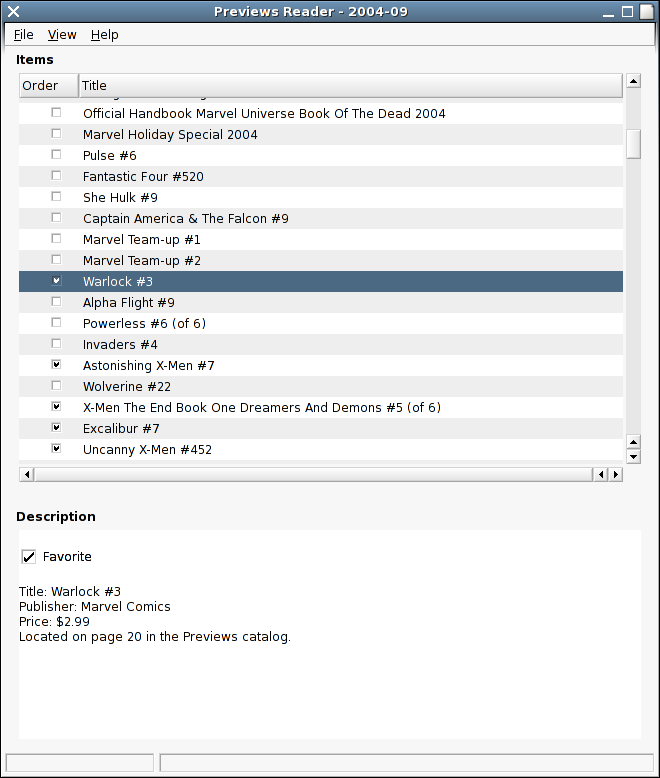 Added automatic updating of description when using keyboard to navigate through the comic list (thanks to Terence Ripperda). BackupFiller is a small script to help easily backup a directory (and all files and subdirectories in it) to CDs, DVDs or whatever. BackupFiller creates path-list files that can be used together with mkisofs to produce iso images which can then be burned to CD or DVD. Newest version is BackupFiller 0.2. Decreased the sizes of CD and DVD to better make sure the end results will actually fit on the media. If you came here looking for a specific program and cannot find it you might try looking at my list of old and unmaintained software.